61% back term limits for Supreme Court justices, including 67% of Democrats and 58% of Republicans. 71% of Republicans say the Senate should vote to confirm Judge Brett Kavanaugh, compared to half of Democrats who oppose it. A majority of voters support term limits for Supreme Court justices – suggesting Americans don’t want the high court’s makeup to be permanent, as President Donald Trump attempts to get a second nominee confirmed this year. The latest Morning Consult/Politico poll was conducted July 13-14, in the days after Trump announced Judge Brett Kavanaugh as his nominee to replace retiring Justice Anthony Kennedy. The poll also found Kavanaugh inspired stronger opposition than did Judge Neil Gorsuch, Trump’s first pick to the Supreme Court, after he was nominated last year. 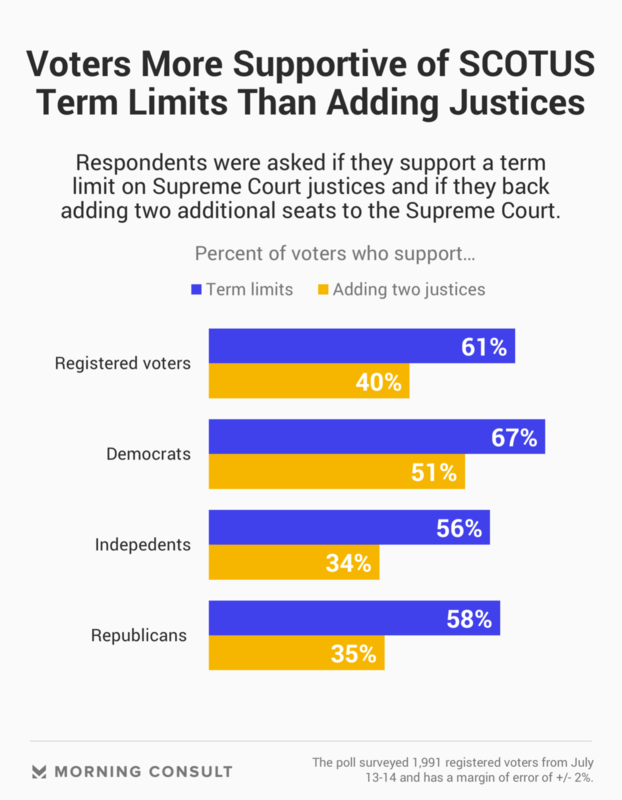 Sixty-one percent of voters support term limits for Supreme Court justices, including two-thirds of Democrats and 58 percent of Republicans. Twenty percent overall oppose such limits, according to the survey of 1,991 registered voters. Fix the Court, a nonpartisan advocacy group, is pushing a plan that would place an 18-year limit on a judge’s term, which would start as current judges leave and new ones come in. Roth said despite momentum in the legal community and among many Americans in support of term limits, there is no such movement on Capitol Hill and a number of legal scholars argue such changes would require a constitutional amendment. “Since the post-Watergate Ethics in Government Act that required justices to release their financial disclosure reports, there has been little action in Congress to change the institutional structure of courts,” he said. Josh Blackman, a constitutional law professor at South Texas College of Law Houston, said while there is support for term limits, the challenge is in how to implement them – whether they are made retroactive or exclusively apply to future nominees. “If you make it forward-looking, it would take literally 30 years for it to actually make any impact,” he said in a Tuesday interview. Kavanaugh, 53, is facing a lifetime appointment – one that could give conservatives firm control of the Supreme Court for the immediate future. Democrats are more opposed to the Senate confirming him than they were at this time in the process to get Gorsuch on the court to replace Justice Antonin Scalia. Half of Democrats oppose the Senate voting to confirm Kavanaugh, compared to 44 percent who said the same of Gorsuch in a February 2017 poll. Roth said the left “has more reasons to be concerned now than when like was replacing like,” in the Gorsuch nomination fight, since Kavanaugh would replace a more moderate justice. 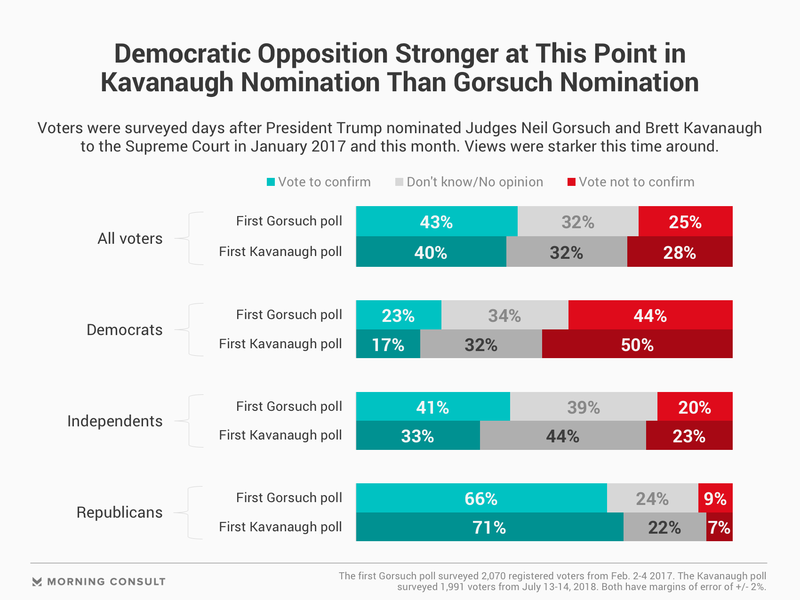 On the other hand, Republicans are more supportive of Kavanaugh’s nomination than they were of Gorsuch’s, with 71 percent saying the Senate should vote to confirm him – 5 percentage points higher than at this point in the Gorsuch nomination process. Overall, 40 percent of voters say the Senate should vote to confirm Kavanaugh – down 3 points compared to Gorsuch – and 28 percent said it should not. Thirty-two percent of voters said they didn’t know or had no opinion in the survey, which has a margin of error of 2 percentage points.